“We are the youngest country with 65 percent of our population below 35 years of age. We are the world's largest democracy and we have a huge domestic market to feed. No country has such an opportunity as India to create jobs with human capital and abundant natural resource,” Narendra Modi is quoted saying on his website, and he couldn’t be more correct. India definitely has an opportunity, maybe the best opportunity in the world given the average age of its population (In 2020, it is expected to be 29 years). But how can the demographic dividend be leveraged when there are not enough jobs? The analysis highlighted how eight significant employing sectors, had created the least new jobs in the year 2015 since the recession of 2008. The situation isn’t much better one and a half years after it was first reported, and two years after the data was last recorded and published for public use by the Labour Bureau, Ministry of Labour and Employment, Government of India. The manufacturing sector has had a sluggish year owing to a combination of factors – but two of them stand out – demonetization in November last year, and the imposing of Goods and Services Tax in July this year. This has translated to a slowdown in job creation, and also many individuals losing out on their jobs because of a struggling manufacturing sector. According to TeamLease Services Ltd., the country will see a further 30 percent – 40 percent reduction of jobs in the manufacturing sector compared with last year. The wages of those still employed in the manufacturing sector have taken a hit. The hourly median wages factory workers have dropped from Rs. 250+ in 2015 to somewhere around Rs. 200 in 2016, as reported by Bloomberg. With the manufacturing sector still trying to recover from the jolt, it is ungainly to expect the sector which directly employs 12 percent of the population, to employ more people. It is hardly able to keep those 12 percent within the fold and pay them competitive wages. India was boasting of the best employment outlook among all the countries that the ManpowerGroup’s employment outlook survey studied at the start of 2016. While the employment outlook was still second best at the start of 2017 – it had fallen from 42 percent in 2016 to 24 percent in 2017. This is a significant fall in the outlook percentage – in fact, the highest among all the 43 countries studied, and the 59,000 employers of those countries and territories interviewed. The employment outlook has been on a downward spiral after starting 2016 boastfully (staying on par with the 2015’s year-end predictions. The situation has improved slightly after a miserable Q2 in 2017. 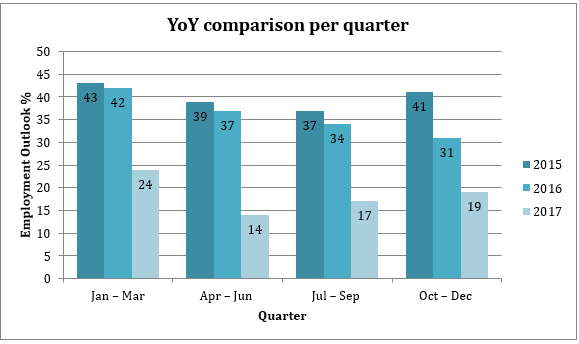 Q3 and Q4 have been a little better in comparison with Q2, putting a halt to the dip. However, it is still nowhere close to satisfying the hopefuls. 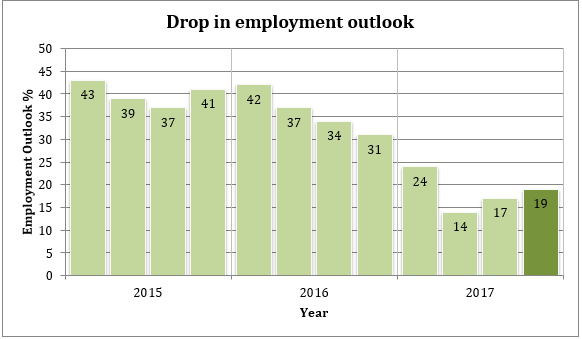 The graph below represents the downfall in the employment outlook percentage of the 5005 employers surveyed in India. These are, or rather should be, worrying signs for the country. While the outlook is positive, it doesn’t seem enough to accommodate a large number of people seeking employment in the country. According to International Labour Organization, the number of unemployed in India is expected to rise by 1 lakh in 2017, and a further 2 lakh in 2018. The quantum of unemployed will go up to 18 million next year, according to ILO. The government has acknowledged the need of the skilled individual to make up the workforce in India – India’s government estimates the country will need an “extra 110 million workers across 24 sectors of the economy by 2022”, according to Bloomberg. That has been the rationale behind the nation-wide mandate of skilling the people in the working age. A great initiative by all means. At least in principle. The state has failed to meet its targets to skill people almost every year. See the illustration below from Bloomberg. 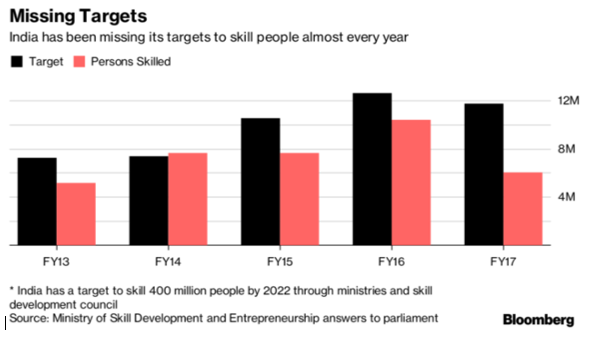 The gap between the target and the people skilled is clearly noticeable, and the state doesn’t seem equipped to meet its target of skilling 400 million by 2022. A recent report in the Indian Express made a startling revelation – “Not even a tenth of the 30.67 lakh youth who had received or were undergoing training under the Pradhan Mantri Kaushal Vikas Yojana (PMKVY) as on early-July have obtained job placement offers.” Whether it is because they aren’t employable enough, or it is simply a case of not enough jobs in the market – the outcome is worry-some and requires immediate attention. 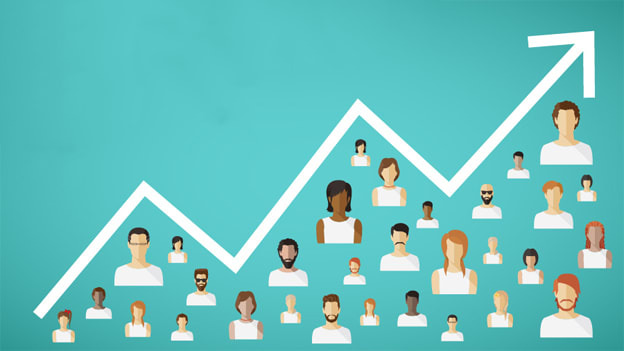 While macro-level data on jobs created has been amiss for the past two years (when the 28th quarterly report on the effect of economic slowdown on employment in India was released), the situation surrounding job creation and employment feels dire. It may be because of the state’s silence on the issue of job creation or maybe because when the state delivers its rhetoric, it is not quite backed by facts obtained from a robust methodology. It was reported earlier in the year that the Labour Ministry is working towards revamping the study of calculating jobs created by including other sectors than the eight that have been covered in the ‘Effect of economic slowdown on employment in India’ quarterly reports made available to the public between the period of October 2008 and December 2015. There is an aura of uncertainty and fear surrounding the job market (Yashwant Sinha’s admission of the disarray the economic situation and the job market is only working as a multiplier) – and the least the state could do is give an honest picture of the situation, replace the rhetoric with actual facts and figures obtained via a robust methodology, admit if there aren’t enough jobs and people aren’t skilled, and then start work towards rebuilding the job market. The job-seekers could benefit from it, and return the favors to the state and its economy once employed!